Starfield Hanam, an enormous shopping and entertainment mall, has become the new hot spot for South Koreans in the past month. Located in Hanam, Gyeonggi Province, southeast of Seoul, the shopping mall attracted more than 1.5 million visitors within 10 days since opening on Sept. 9. Equivalent to 70 soccer stadiums combined, the massive mall is a collaboration of South Korea’s retail giant Shinsegae Group and US shopping mall centers management firm Taubman Centers. 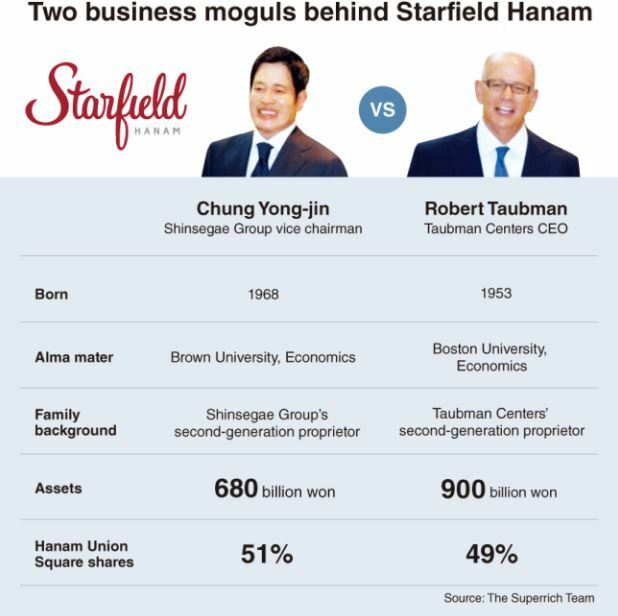 Shinsegae Vice Chairman Chung Yong-jin and Taubman Centers CEO Robert S. Taubman pushed to set up the mall’s operating firm Hanam Union Square, with a 51 percent stake held by Shinsegae Group and the rest by Taubman Asia, an Asian unit of Taubman Centers. At the opening ceremony, Taubman said the project was thoroughly promoted by Chung and praised his persistent spirit. However, the two business leaders share more than just a mindset on running the mega-sized shopping mall. Chung and Taubman each have a degree in economics from US universities. Chung studied economics in Brown University while Taubman at Boston University. Both joined their family business in their 20s and later reached chairmanship. Chung, then a 27-year-old, entered Shinsegae in 1995 as the group’s strategy and planning team director. He was promoted to vice chairman in 2006. Taubman was a 23-year-old college graduate when he started his career in Taubman Centers in 1976. He spent 35 years there and was appointed as chairman in 2011. The two are fathers of four kids as well. Chung has two kids from a previous marriage with famous actress Go Hyun-jung and twins with his current wife and flutist Han Ji-hee. Taubman has three sons and one daughter with his wife and author Julia Reyes Taubman. By assets, Chung is richer than the average American entrepreneur. Chung is Korea‘s 48th wealthiest man owning 683.9 billion won in total, including a 9.83 percent stake in E-mart, a discount chain under Shinsegae. Taubman holds 5.37 percent of shares in Taubman Center, worth 900 billion won. At Starfield Hanam, a wide range of global automobile manufacturers offer a luxurious car riding experience. Hyundai Motors’ high-end sedan Genesis opened its first display studio Genesis Studio for a test ride. It displays three different types of automobiles including EQ 900 Limousine, G80 and G80 sports. Product explanation in details is also provided by salesperson. Chung Eui-sun, Vice Chairman of Hyundai Motors Group, has been on the forefront to push for Genesis, after unveiling it at a motor show in Detroit this January. Another luxurious automobile manufacturer BMW opened BMW MINI Lounge. BMW‘s first partnership with MINI provides opportunities with visitors to test two different vehicles at once. The world’s No.1 electronic car maker Tesla is arriving at Starfield next month as well. Starting with a retail shop, a high-end “model S,” a SUV “model X,” and a classic “model 3” under development are slated to be displayed to the visitors. Sales will kick off as well when approved by the Korean government. Harley Davidson opened a store specializing in motor cycles and the brand’s clothing. This was the first time the US headquarters took a lead designing the Korean store. Harley Davidson is currently under the management of Chairman Matthew Levatich, whose assets are estimated worth $10 million. An Italian lifestyle product brand Tonino Lamborghini opened its first Korean store at Starfield. Tonino Lamborghini was launched in 1981 by the son of the founder of luxury sports car manufacturer, Lamborghini. The sports car maker was acquired by Audi in 2008 and now operates under the Volkswagen Group. Tonino Lamborghini is still operated under the Lamborghini family. A California-based shoes maker TOMS Roasting Co. started its first flagship store in Starfield Hanam. Quality coffee is offered while visitors try on shoes, bags and eyewear. TOMS is known for its unique business model “one for one,” encouraging customers‘ giving pleasure to people in need. Since 2014 TOMS Roasting Co. adopted the model so that one purchase of coffee here provides clean drinking water to people in developed countries. For example, if a customer bought a pack of coffee beans at a cost of $12.99, then those without clean drinking water would receive enough for seven days. TOMS founder Blake Mycoskie invented the unique business model. Along with the company growth, Mycoskie‘s assets jumped to $300 million. The world’s biggest pharmacy chain Boots is joining the Starfield Hanam early next year. At over 13,000 stores in 11 countries, the UK-based drug store sell self-made cosmetics and living necessities. Prior to Starfield Hanam opening, E-mart signed a deal with Wallgreen Boots Alliance in July for exclusive management control over the chain in Korea. Stefano Pessina, the CEO and the largest shareholder of WBA, has assets woth $13.7 billion.